Ohio offers a little bit of everything - from world famous amusement parks to historic landmarks to adventures galore. Whether your kids are into sports, want a little fun and education, or simply want to let loose, there is something for everyone in Ohio. Why not take the kids to the zoo for the afternoon? Nestled on just 50 acres outside of downtown Akron, the Akron Zoo is not the largest zoo but what it lacks in size, it makes up for in a unique experience. Being one of the few accredited conservation zoos in Ohio, the Akron Zoo actively pariticpates in rehabilitating endangered species, which means that you will get up close and personal with more than 700 different species of animals on your visit. The zoo is open from 10am to 5pm during the summer season and 11am to 4pm during the winter season. Tickets are $10 for adults and $6.00 for children. Consistently ranked among the top ten children's museums in the United States, Duke Energy Children's Museum is a hands-on heaven for busy little ones. 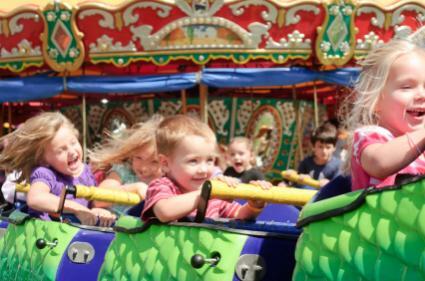 Located in Cincinnati, it's the perfect stop for a little activity time for the younger children in your group. The most notable feature of the museum is its programming, so you'll want to hop online before heading there to see what's on the agenda for the day. The Cincinnati Zoo is the second-oldest museum in the country and is noted for its wildlife conservation and rehabilitation programs. There is always something going on at the zoo, whether it be live outdoor entertainment or seasonal events that are sure to please. If you know in advance that you'll be stopping by, you may want to schedule an animal encounter (you can reserve your spot online), or buy tickets for the 4-D theatre. Listed on the National Register of Historic Places, German Village sits south of downtown Columbus. Settled in the mid-1900s by German immigrants, the village still retains its historic and educational flair. Strolling through the streets of the village, the children will learn about the history of the region. A privately-funded preservation district, the area has been lovingly recreated to retain its historic significance. Each October, the district holds an authentic Oktoberfest that offers fun for young and old alike. What child can resist a trip to a candy factor? Every Tuesday and Thursday, the Anthony Thomas Candy Factory in Columbus opens its doors to the public from 9:30 am to 2:30 pm. Admission costs $1.00 for children 3 to 18. Adults pay a $2.00 admission. Group tours are available with advance reservations. Tour guides take visitors through the 152,000 square-foot candy factor. The factory produces 25,000 pounds of chocolate per shift. After the tour, guests can enjoy shopping at the 2,500 square-foot retail shoppe. Approximately four miles east of West Libby, sits the Ohio Caverns. Children will experience awe upon viewing the cave's stalactite and stalagmite formations. During the summer months, visitors can tour the cave from April 1 to October 31 from 9 am to 5 pm daily. From November 1 to March 31, visitors can visit the cave from 9 am to 4 pm. A regular tour lasts approximately 50 minutes and the historic tour averages 1.5 hours. Visitors can purchase a day pass or a yearly pass. In Cleveland, children can enjoy the Rock and Roll Hall of Fame and Museum. A place of fun and education, children will learn about the diversity of music throughout the years. The museum spans seven floors and encompasses 150,000 square feet. Five theaters located in the museum offer educational movies throughout the day. The museum is open all year except Thanksgiving and Christmas. A hands on science museum, the Great Lakes Science Center 400 hands-on exhibits for children to learn from. Dedicated to providing an educational experience, the museum provides about 4,000 demonstrations per year that center around the environment, science and technology. The center spans 250,000 square feet. Each day the schedule of events changes. Hop aboard the Cuyahoga Valley Scenic Railroad with the children for a trip back in time. The train, one of the oldest in the nation, runs along the Cuyahoga River for a scenic trip. Fares and times vary per season. Consult the railway for an up to date schedule and to make advance reservations. In the Cincinnati areas, families can tour the National Museum of the U.S. Air Force. The museum strives to transport visitors through aviation history. Children will thrill at the chance to tour authentic aircraft such as Kennedy's Air Force One, which was used to transport the president's body to Washington D.C. in 1963. The museum offers free admission to young and old. It is open all year except Thanksgiving day, Christmas Day and New Years. As any parent knows, the key to having a great day out is to prepare so there are no surprises. To that end, the state tourism website, Discover Ohio, offers visitors a really useful itinerary builder tool. You can build your own itinerary by inputting something that you want to do, or you can browse pre-made itineraries to help you get the lay of the land. Using the itinerary tool is definitely a must if you want to make sure to go to the best places with your kids.